We’d love your help. Let us know what’s wrong with this preview of Ride the Wind by Starla Huchton. Once upon a time, I made a promise to a stranger. Though I'd never seen her face, I cared for her above all others. Once upon a time, I broke my vow. In trying to save the one I loved, I condemned her to a cursed life and stripped her of all freedom in a single, misguided step. Once upon a time, I set out on a journey. Though it might never earn me forgiveness, I would set h Once upon a time, I made a promise to a stranger. Though I'd never seen her face, I cared for her above all others. 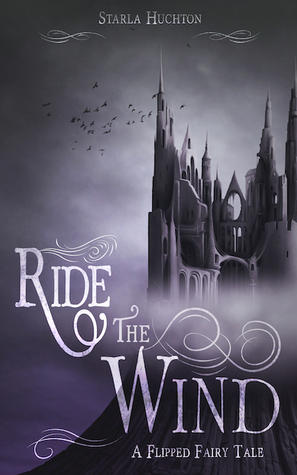 To ask other readers questions about Ride the Wind, please sign up. 4.5 stars -- Well that was utterly enchanting. Oh, and before I go on, I received an ARC from the author for me to review! Truth #1 -- while the concept of the Flipped Fairy Tales that Ms. Huchton writes have had me completely intrigued since I met her at UtopYa this year, this is in fact my first book by this author. And it won't be my last. Truth #2 -- I know NOTHING about the original fairy tale this book is based off of. About halfway through the book 4.5 stars -- Well that was utterly enchanting. Oh, and before I go on, I received an ARC from the author for me to review! Truth #2 -- I know NOTHING about the original fairy tale this book is based off of. About halfway through the book I became curious, and started to look it up, but I didn't want to ruin the story for myself, so I held off. Truth #3 -- this book is so totally out of my wheelhouse, that I'm actually surprised by my thorough enjoyment. What do I mean? I'm a modern setting/writing kind of girl. I tend to steer clear of historical books and high fantasy, and I prefer...I don't know how to describe it.... I just can get a bit lost and lose interest when the manner of speech and voice is more formal? maybe? I just end up sticking with contemporary settings, or if they're futuristic settings, then more casual or "normal". I'm probably bumbling this up, but please tell me you know what I'm talking about? So this book was a little bit outside of the norm for me. I think it's that usually I find it really hard to relate to the characters if I can't imagine myself in the story. So I'm desperately trying to figure out what made this story stand apart for me. B/C I couldn't really see myself in the story, but I was epically immersed all the same. I think my enchantment starts with the unique and captivating plot. I was telling my husband about the story and mentioned that it was a bit more fantasy like. But one thing that stands apart is that the hero doesn't have magical powers and this destiny to be a great hero. He's just a boy who holds strong convictions, has a beautiful heart, and suffers for the mistakes he makes. So he's kind of an everyman in some ways. He's so easy to empathize with, and you're given ample opportunity to get to know him in the first half of the book. And in that way you're invested in him as a character and so you root for him through the second half of the book. And I just realized I started this paragraph talking about plot and have somehow devolved into talking about my favourite part of a book -- characters. (Oops.) It's not that Lukas is without flaws. But he's endearing all the same. And the same goes for the Elk and Erata -- flawed characters, but with enough heart to make us love them. And it's not just the main characters that stand out. Lukas meets so many people along his journey, and they all had their own unique voice. The world building in this story was also strong -- we traveled to so many different places, and I could imagine each one. I even feel like I spotted the setting (and a character) for the next Flipped Fairy Tale, so I'm anxious to learn if I'm right about that. I have but one complaint -- and it's really more about my personal taste than anything. I could have used a smidge more in the romance department. What can I say, I'm a diehard romantic -- and I just felt more in the friendship chemistry department than in the romance one....either that or I just wanted MORE. But maybe it wouldn't have fit in with the story, what do I know? I received a free copy of Ride the Wind by the author in exchange for an honest review. I have read the first two installments in this flipped fairy tale collection and absolutely could not wait to read this one. I can honestly say that this author wowed me again, because I really loved it; I loved it so much that I read it in two days! The story begins with a man named Lukas who has been assisting his mother around the house. When Lukas’ mother goes to collect their animal traps, she runs into I received a free copy of Ride the Wind by the author in exchange for an honest review. I have read the first two installments in this flipped fairy tale collection and absolutely could not wait to read this one. I can honestly say that this author wowed me again, because I really loved it; I loved it so much that I read it in two days! The story begins with a man named Lukas who has been assisting his mother around the house. When Lukas’ mother goes to collect their animal traps, she runs into an Elk. After Lukas goes in search of her, she informs her son that this is not just any Elk, but a magical creature that was sent to change his future. The Elk has been wounded, with its hoof stuck in a dangerous crevice. With no escape, Lukas knows that the wolves would surely kill the animal by nightfall if he and his mother do not provide aide. After the Elk is free, he is forced to make his mother a promise that could quite possibly bring him to his death. He is tasked with walking the Elk back up the mountain to where it can stay safe; this is where his adventure begins. When they come upon a door that is crested with dragons, he knows not what he has walked into. With dragons, one mysterious woman, a magical elk, and promises made in the dark—Lukas has never felt so hopelessly lost until it is all taken away with the wisps of a lighted candle. My favorite characters are Lukas, Erata and The Feathered Man. Lukas is so compassionate and brave, but he doesn’t fully understand the weight behind the promise that he has made to the woman in the dark. When he is asked to stay with her forever, even though he has never seen her face—he is leery and confused. He feels that it is the right thing to do, but doesn’t comprehend the importance of the shrouding darkness that surrounds them. Everyone and everything is vague, the only request that makes sense to Lukas is their insistence that he wait. In time, all answers will be revealed. Now, Erata is beautiful—but always fearful. Her desire to find love, to ride the wind and to escape the loneliness of the darkness that was originated by her own doing is so tragic, but her story makes her character that much more intriguing. I wanted to know the story; I couldn’t put the book down until I understood. Because this story is so unpredictable, the reader doesn’t actually find out what is going on until Lukas does. During his adventures, he discovers a little more with each quest. All of the other supporting characters that Lucas encounters are also enticing as well. Erata’s sisters are always wonderful and very helpful with Lukas and the three brothers provide him with objects to carry with him. Of the three brothers, The Feathered Man is the most mysterious and powerful. He commands the room with his presence and his shadow is most sought out for in the vast desert. His story is beautiful and majestic and I really loved reading about his part in this adventure. Overall, I rate this story with five stars because the content is high original and creative. This adventure is fascinating and exciting, all while unravelling before your eyes! The pace is quick and easy to follow with little or no errors in writing style. The words are fluid and the story is mesmerizing. The author does a superb job with character development and I was very impressed that all of my questions were answered by the end of this novel. In my opinion, the target audience for this story would be young adults interested in fairy tales and fantasy or mythological genres. This book can be read as a standalone, but it is interrelated with the other flipped fairy tales in this collection. I would definitely recommend this book to others and I look forward to reading the next installment in this series. Recommends it for: anyone looking for an excellent escape, a great read, or a new twist on an old tale. I bought a set of the entire Flipped Fairy Tale collection in paperback from Starla Huchton for my ten-year-old daughter's Christmas gift. Of course, being a fan of Shadows on Snow, I knew I'd likely sneak and read all the stories behind her trusting little back. I managed to make it through one of two before she caught me, and you all have a review as a prize for my dastardly ways. Now that you know where I got the book, let's dive into the review. I'm a fairy tale nu I bought a set of the entire Flipped Fairy Tale collection in paperback from Starla Huchton for my ten-year-old daughter's Christmas gift. Of course, being a fan of Shadows on Snow, I knew I'd likely sneak and read all the stories behind her trusting little back. I managed to make it through one of two before she caught me, and you all have a review as a prize for my dastardly ways. Now that you know where I got the book, let's dive into the review. I'm a fairy tale nut. From The Princess and the Pea to Hans and the Little Iron Man, I've read hundreds. Huchton's retellings always leave me with that same sense of child-like awe the originals did. I dive in, getting lost in the carefully crafted stories, hoping against hope the guy ends up with the girl. Well, this novel didn't disappoint me. Ride the Wind is such an intricate story of faithfulness, I was sitting on the edge of my seat, shaking the main character, Lukas, when I can see the detrimental mistake he's about to make. I was talking to the book in my hands as though he could hear me. Then, he goes and does it anyway. No, I can't tell you what "it" is, but I can tell you from that moment on, he fights with everything in himself to make it right. A perfectly flawed hero. I loved it. Why? Because he felt so real to me. Huchton never leaves you bored, and her pacing was spot on. World building was perfect. I could see it all, but she didn't go on and on with bog-you-down description. One of the things I enjoyed most was finding characters from Shadows on Snow making their appearance. I didn't put it together right away, and was pleasantly surprised when I unraveled the clues. Brilliantly done. Nothing noteworthy. I didn't stumble, shake my head, or get annoyed with errors. Gorgeous editing. “It’s not about pursuing adventure, so much as seeing the adventure life already is.” (Kindle Locations 892-893). Lukas is raised to be compassionate and when his mother tells him he needs to care for a magical injured Elk, he only pauses briefly. He promises his future to saving the creature and his word is a bond. Given a second chance to love blindly, will Lukas be able to wait in the dark or will his curiosity and worry get the best of him? This flipped fairy tale features the prince and his s “It’s not about pursuing adventure, so much as seeing the adventure life already is.” (Kindle Locations 892-893). This flipped fairy tale features the prince and his story as he meets the ‘princess.’ I always want the princess story, but I was pleasantly surprised by the boy’s perspective. This is probably because he isn’t the stereotypical loud mouthed, boisterous, save everything in sight overbearing prince. He is a real person who was raised to be compassionate and motivated. He is sheltered, which adds to his odd behavior at times or how willing he is to jump into a ‘forever’ scenario, but he is also grasping at his second chance. Both the prince and princess have believable and full back stories that contribute heavily to their current situations. The princess Erata and the Elk come from somewhere, they aren’t simply a Rapunzel from the tower. They came from a life before the magical house. They made mistakes to get to where they are now. Even the Prince has made his own mistakes in the past. I only thought it was mildly odd that the creature in the story was an elk. There are dragons and such and one of the main characters is an elk? It fits when you think about the setting, but is still odd to visualize. I love all of Starla's books, but the flipped fairy tales are my favorite. I was especially excited about this one, because I'd never heard of the original story it's based on, East of the Sun and West of the Moon. So I got to learn more about a classic fairy tale I wasn't familiar with. The other thing that made this one a little different than Shadows on Snow and The Stillness of the Sky, is that the "hero" in the original telling is female. So while I LOVE that these gender flipped stories ar I love all of Starla's books, but the flipped fairy tales are my favorite. I was especially excited about this one, because I'd never heard of the original story it's based on, East of the Sun and West of the Moon. So I got to learn more about a classic fairy tale I wasn't familiar with. The other thing that made this one a little different than Shadows on Snow and The Stillness of the Sky, is that the "hero" in the original telling is female. So while I LOVE that these gender flipped stories are kind of "girl power" it was nice to switch it up and see the man being the hero. These books aren't about who saves who anyway. They're about how anyone can become the hero of their story. And they're about love- no matter who that's with or what difficulties must be overcome to obtain it. The plot is definitely thickening in this one! While each book in this series can be read as a standalone, I love how the other plot lines are woven in so seamlessly. We get a very obvious setup for an Aladdin story (EEP!!!) and a tiny tease about a Red Riding Hood one as well that I am especially excited about! These books are getting better and better. The overlapping story lines are creating more complex plots, and I audibly gasped multiple times. I may have even squealed once. ‘Ride the Wind’ is a re-telling of ‘East of the Wind, West of the Moon’ set in the fairy tale world established in Huchton’s ‘Shadows on Snow’ and ‘Ride the Wind.’ A well-written and enjoyable tale with Huchton’s signature enchantments. Great series for anyone who like fairy tale re-imaginings. A geek of all trades, Starla Huchton has been crafting stories in various genres since 2007. She is a three-time finalist for Parsec Awards for her podcast fiction work, and was the first place winner for Science Fiction & Fantasy in the Sandy competition in 2012. Her work spans science fiction, fantasy, New Adult Romance, Young Adult titles, Steampunk, Contemporary, and various other varietie A geek of all trades, Starla Huchton has been crafting stories in various genres since 2007. She is a three-time finalist for Parsec Awards for her podcast fiction work, and was the first place winner for Science Fiction & Fantasy in the Sandy competition in 2012. Her work spans science fiction, fantasy, New Adult Romance, Young Adult titles, Steampunk, Contemporary, and various other varieties of stories. She is greedy and likes all the genres!